Marrying within the faith is still common in the United States, with nearly seven-in-ten married people (69%) saying that their spouse shares their religion, according to a recent Pew Research Center survey. But a comparison of recent and older marriages shows that having a spouse of the same religion may be less important to many Americans today than it was decades ago. Our Religious Landscape Study found that almost four-in-ten Americans (39%) who have married since 2010 have a spouse who is in a different religious group. By contrast, only 19% of those who wed before 1960 report being in a religious intermarriage. Many of these recent interfaith marriages are between Christians and the religiously unaffiliated (sometimes called “nones”). Of all U.S. adults married since 2010, almost one-in-five (18%) are in marriages between a Christian and a religiously unaffiliated spouse. This is true for only 5% of those who married before 1960. Some research suggests that marriages between members of the same religious group may be more durable than intermarriages. If this is true, the rise in religious intermarriage over time may not be as pronounced as it appears, since the Religious Landscape Study measures only marriages intact today (i.e., it is possible there were more intermarriages before 1960 that have since ended in divorce). In any case, interfaith relationships are even more common today among unmarried people living with a romantic partner than among those who are married. 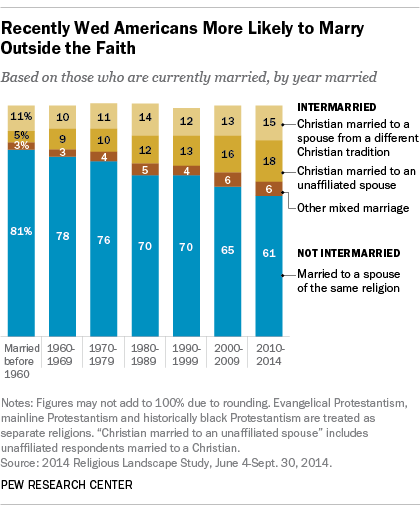 Nearly half (49%) of unmarried couples are living with someone of a different faith. The survey also shows that members of certain religious groups are more likely than others to be with someone of their faith, whether they are married or living together in a romantic relationship. For example, more than three-quarters of U.S. Hindus (91%), Mormons (82%) and Muslims (79%) who are married or living with a partner are with someone of the same religion. This is somewhat less common among Jews (65%), mainline Protestants (59%) and religiously unaffiliated people (56%). Caryle Murphy is a senior writer/editor focusing on religion at Pew Research Center.